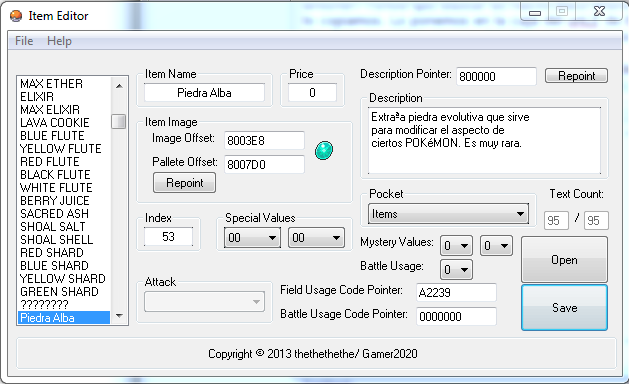 The tools I'm using are HxD, Item Editor v2.0.0 (by thethethethe & Gamer2020) and inside built Pokemon Editor from GBA Pokémon Game Editor. I'm also using a clean ROM of Fire Red USA. 1.- Inserted a new item (image and palletes) on index (53, 35 in HEX), and make it look like an evolutionary stone. 2.- Took the index in HEX, subtracted D (35 - D = 28), the result multiplied by 4 (28 * 4 = A0) and the added to OffsetA (A0 + 2528BC = 25295C). 3.- Went there with HxD and wrote the pointer to the free offset of A (10 in DEC) bytes, that was the 0000D2 offset (pointer should be D2 00 00 08). On the free offset made all of them 00 and the fifth one (offset + 4, so it was on 00 00 D6) 80. Saved everything and made Charmander evolve with that stone to try it. If you can fix, please let me know. yes, I had installed a couple of routines before that. I really don't know anything about how setup.py works, to tell you the truth. Since I use 3.3 and Windows, that whole scene hardly ever works very well for me so I haven't bothered investigating it. The python docs seems to have a decent tutorial for it, though [x]. 10:56 PM - BlackAnarchy★ quoted karatekid552 in post Is it Possible to Include Both GoGoat riding and Bikes? 04:52 PM - mewthree9000 quoted karatekid552 in post Animated Avatars?